Good news for those of you who have been eyeing the $70k price tag of the Panasonic 103-inch plasma and wishing it would drop a few grand, maybe several grand, or maybe down to the price of a mid-range car — just low enough to get one in your house. The gigantic 1080p display from Panasonic has dropped $20k, to $50,000. That’s about $485 per inch, down from about $680 an inch. 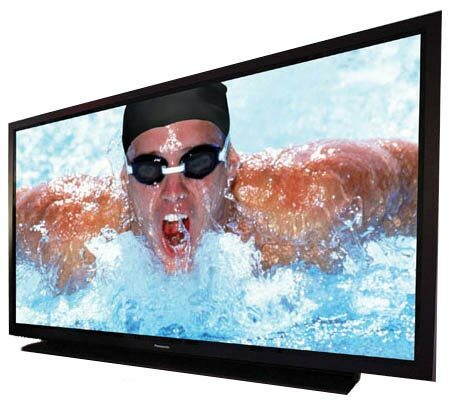 Who is buying the 103-inch plasma? Panasonic says it is being used in high-end home theaters, higher education, digital signage, and in many other commercial applications. NBC uses it in their Sunday Night Football studio, as well in the 2009 Beijing Summer Olympics studio. CBS uses it on The Early Show set, and TNT also uses the display in their NBA Playoffs studio. The Panasonic TH-103PF10UK comes with a 100,000-hour service and backed by a 3-year warranty. More information about the Panasonic Professional Display Company can be found at http://www.panasonic.com/proplasma.